What are you passionate about and what is your passion contributing to the world? I am passionate about so many things: teaching, dancing, writing, life and people. From a young age, I was playing “the teacher” of my school friends, or the “theatre director” with the plays or stories I wrote and they would act them on the school stage. Thinking about my passions, I would say the first 2 are writing and teaching. I thrive on teaching young people and making a difference to their lives, big or small, every change matters. That has been my contribution to the world for the last 25 years! Gosh, time flies. Now that I am at the beginning of my journey as a the author of “Never Saw You Coming”, I want to contribute to the world by enriching the readers’ experiences with books and stories they can relate to, even though they are fiction stories. I want to continue writing books which enable the readers to escape reality, and immerse themselves into fictitious stories that feel real. Describe a breakthrough moment in your life that you wish to share? After living so many romantic fiascos, whilst I was ill and in pain on my bed for 3 weeks [my lumbar puncture went very wrong, ginormous pains followed and I had to return to hospital for an emergency blood patch… This is how Multiple sclerosis entered my life], I got thinking: “Why is it that I continually fail one relationship after the other?” I needed to find answers to that question. There was something that had to change. I reflected on how I had been expecting my men, my boyfriends, my lovers, my partners, to be X Y Z, to suit me, and if they did not, the relationship would eventually collapse. I realised that I needed to understand men, because in fact, I knew very little about the male psyche. I needed to understand how they functioned “up there” and how male and female brains work, could work in harmony. So I spent my 3 weeks of illness reading all sorts…. At the end of it all, I realised that I had to change. And Maya Angelou’s saying made so much sense to me then! She said: “If you do not like something, change it, if you can’t change it, change your attitude to it”. I learnt to look at males in a different way and my attitude to them softened, became more flexible and creative. I no longer carried this tick list in my head. Looking back at it, what made it such an important part of your journey? I had had the time and space to be alone to think deeply into myself and my life journey. I was determined to get better, not only physically, but also in my whole well-being. My health was going to face some big challenges, I knew I was going to be diagnosed with multiple sclerosis, but I also wanted to live a true love story, and not in the sense that it had to be all rosy and pretty like in romantic films…. I wanted to live to find “unconditional love”. That is concept I had heard of, but actually never felt. So after reading all these books, watching all these love guru programmes, I decided to work on me and create a new me to discover unconditional love, starting with me. Learning to love myself with my flows, and accepting them, before expecting another to love me. Looking inwards was a whole new journey for me, terrible health but healthy love was my new challenge. My past fiascos were no longer my failures, but chapters and lessons in my life. Based on your knowledge, wisdom and experience, what would you like to change in your lifetime? I think that I would like to try and open the minds of fellow women to hep them see how they can bring value to themselves and be happy with who they are. We, women, too often try to be someone to please another person, forgetting or hiding to ourselves who we really are. I hope I’m making sense! I would like to help women to be their better selves. What are the top tips did you learn from becoming an author? I have learnt that self-discipline is difficult to achieve when life makes demands on us, so being self-disciplined with our writing time is crucial. When my need to write intensifies, I must isolate myself away just to write with no distractions. Somewhere away in the country with no cars, and no mobile phones, or just a little for emergencies. Another tip: make a start, even the smallest paragraph can lead to so much more. Starting is the key. “If you do nothing, nothing will happen”, that’s my saying. It’s important to be clear about your audience, your why and your message. This will avoid confusion and I think help to reach the right readers. Having clarity about the messages you want to share, right from the front cover to the last page of your book helps the creative process. What would you tell other women who might have the desire to publish a book but feel there is not enough support for them to do so? Never give up and keep trying, there will be someone who will say “Yes, I’ll publish your book”. I remember sending samples of my book to various literary agents and receiving a lot of negative responses such as “Sorry, this is not our genre” or no responses at all! Then some interested companies responded, and I was able to choose the one which package suited me best. As a new author, you have no relations in the industry, you are nobody and you are not JK Rowling’s niece, so it is difficult to lift yourself up and show to the world that you have something important to say, to write…. But never give up! It’s your dream, follow it, make it happen! From my perspective, writing a book is climbing a hill, selling a book is climbing a mountain, so be prepared for the long journey. But it’s not impossible, I’ve done it, so can you! What are some of the things you would like to change in your own circumstances? Writing full time as a job and signing a contract to write some more. I would like to have the opportunity to make a film out of my book and the whole trilogy I am writing. 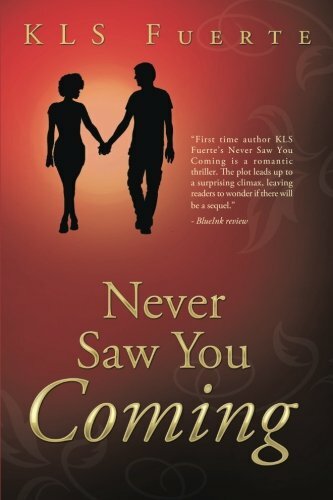 “Never Saw You Coming” is filled with suspense and sharp turns in the plot, it would make a very good “romantic thriller action movie”. The characters are filled with love, passion, emotions and even flirt with death. They will evolve throughout the trilogy and will continue to surprise the readers… I see them as the reflections of life, as though you’d look into a mirror and see yourself. But suddenly, your reflection has a life of its own and plays tricks on you as you watch. What is your key message to our readers? Life is full of surprises, enjoy it, every moment. Love, comes and go, but loving yourself always stays; so protect yourself and learn to walk away from those who are not loving you. Never saw you coming' captured my attention for a whole afternoon, and after a long week, I felt that fiction could be a real treat! Interviewing the Author, the beautiful Kiki, really helped me understand Beatrice- the main character, beyond the layers of nativity and fairy tale fragrances and how much more there is to this story. Knowing the story behind this book, makes it even more captivating, as I discovered that this fictional story line could be the very fabric of the day to day life of any young-beautiful -hopeless- romantic- modern- next-door-girl. As I learned from interviewing this extraordinary talented young author, Kiki's reality is no alien to it all - which makes this book an interesting, must read, hybrid- love story. I can't wait to see this book series turned into a good movie! Escaping for few hours never hurt anyone! Dr. Marina Nani, authored 62 books in the last five years and her upcoming book “Your Stardust Story” is a collection of stories told by 1001 Inspirational people she met during her book tours around the world. A mother and grand mother, Marina is dedicating her time and energy to great causes. She mentors purposeful leaders who educate women from around the world to eradicate poverty, bring prosperity to their family and advance their professional experience. Her role is to present information in an accessible and attractive way, and share Your Stardust Story™ in the process of building up a sense of identity of the people she interviews.The Audience is introduced to new leadership stories, and each new tale brings the latest news according to interview's subject matter: culture, wellbeing, lifestyle, health, business, travel, sport, education, community. Are you an author? Do you want more people to know about your book? Are you looking for innovative ways to reach a bigger audience? We are excited to introduce an amazing opportunity for all authors. Whether your book is a new title or you want to re engage readers with your existing book, our 2-1 video interview and magazine feature offer will give you the exposure you need both online and in the real world! We are audience-centric, prolific, and agile. We can help you adapt your message, keep your finger of the pulse, position your story on top of the game and make the news! Give your book the attention it deserves with this amazing opportunity!